It’s a palace fit for a king and queen, and there are rooms galore for all the little princes and princesses that will surely follow. 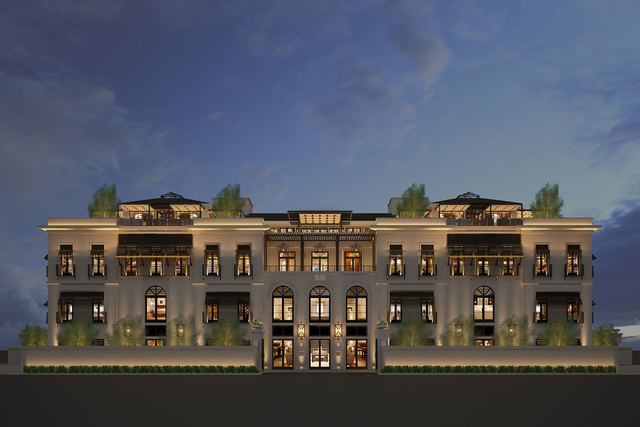 How else to describe the royal home of RH once known as Restoration Hardware? The upscale home-furnishings retailer opens its four-level behemoth in Tivoli Village this morning. RH Las Vegas at Tivoli Village. It’s a palace fit for a king and queen, and there are rooms galore for all the little princes and princesses that will surely follow. How else to describe the royal home of RH once known as Restoration Hardware? The upscale home-furnishings retailer opens its four-level behemoth in Tivoli Village this morning. Its 60,000 square feet of interior and exterior space is not quite double the size of The White House in Washington, D.C.
We received a preview tour of the installations that make up this next-generation design gallery conceptualized as a grand-scale, classical-contemporary structure. 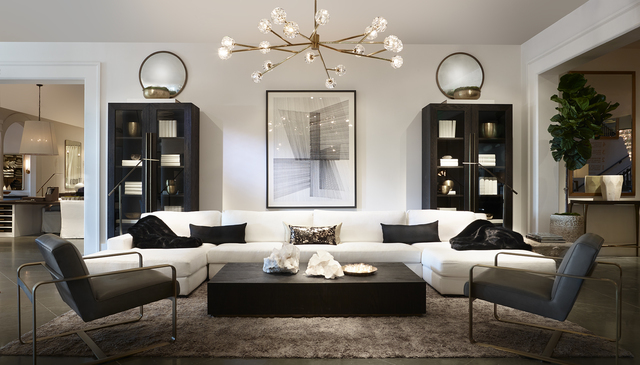 RH’s stores coast to coast are phasing out as the new design galleries transform the Restoration Hardware stores that sold door handles galore. Think of it as a sprawling exhibition of beautiful rooms from floor to ceiling. This new one, which simultaneously marks the opening of Phase 2 of Tivoli Village, is the largest gallery RH has built to date. The rooms that showcase high-end furniture are bathed in natural light and feature Palladian-arched passageways with bedrooms that lead into bathrooms that lead into living rooms. If you’re shopping, don’t expect a brash furniture salesman. Here you get your own dedicated RH interior designer working from an Atelier professional workspace. 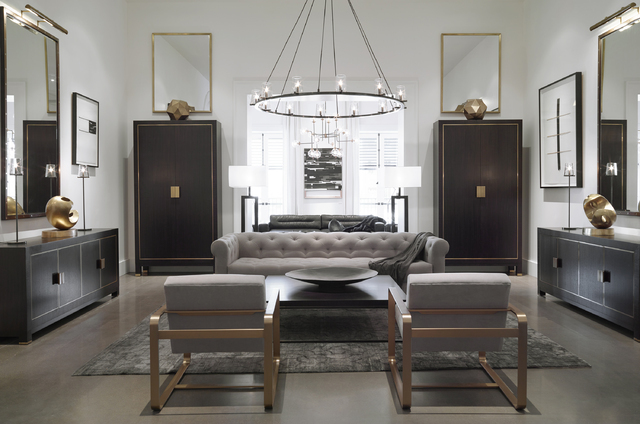 The Atelier designers, an experienced team trained in the RH design ethos to create functional and elegant spaces, take away potential headaches of customizing a single room or entire home. They won’t forget mirrors or lighting sconces. They preside over a collection of furniture and finishes, fabrics, woods, tiles and lighting. 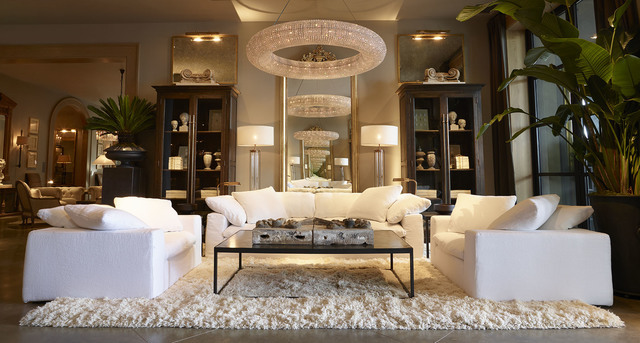 This is definitely the way to shop while furnishing your home brand new or carrying out a makeover room by room. Order what you want, and they’ll deliver it in as little as 2 weeks for in-stock pieces to not longer than 12 weeks for special orders. I walked through the impressive Palladian entrance of this grand-scale, classic-contemporary structure with charcoal-gray Venetian plaster exterior. Expansive glass-and-steel French doors open onto Tivoli Village with towering silver date palms and garden walls lush with fig ivy. There are Juliet balconies, and at nighttime illuminations light up the architectural details and landscaping. I kept thinking of my visits to the Palace at Versailles outside Paris, France. I entered through the courtyards of Mediterranean olive trees, Italian cypress trees and three glass-and-steel arches towering 30 feet high. You land in a central hallway of soaring 12-feet ceilings and Tuscan colonnades that remind of my visits to Italian wine country every July. In this first floor, you’ll find RH Interiors sofas, chairs, tables, beds, linens and bookcases complete with books, one by none other than Frank Gehry, architect of our Cleveland Clinic Lou Ruvo Center for Brain Health prominently displayed on its cover. A grand-double “floating” staircase with 40-foot walls of glass and steel links the central structure with 24 Helix crystal chandeliers hanging 64 feet overhead. The 4,000-square-foot studio workspace for designers and Ben Soleimani rug showroom with hand-knotted and -woven rugs, window treatments and bath hardware is on the second floor. The 17,000-square-foot third floor is dedicated to RH Modern complete with an integrated contemporary art gallery. But it’s the fourth-floor garden courtyard, a 16,000 square-foot open-air terrace and rooftop park conservatory, that is the mindblower with RH outdoor furnishings that frame the panoramic views of Red Rock Canyon. It’s such an attraction, I worry for RH Chairman and CEO Gary Friedman that customers will simply sit down there and stay for the day. “It is my favorite level of the gallery,” he told me. “We believe that Las Vegas is an exciting, emerging international market. We didn’t pay attention to Las Vegas for a long time because it had stalled in the economic downturn, but now the excitement is back again. This is the biggest RH gallery we’ve built thus far. There’s never been a way to shop for home furnishings like this before. It is spectacular — almost grand theater. If you think there was a crush at the opening of IKEA, just think what opening week of RH Las Vegas will be. Gary summed up: “Our vision with RH Las Vegas is to reimagine the retail experience by blurring the lines between residential and retail, indoors and outdoors, physical and digital — creating an environment that is more home than store.